Last weekend, a large part of the world was focused on the fight of the century. At least in the boxing world. Floyd Mayweather and Manny Pacquiao finally fought it out in the ring, after years of not being able to agree on the terms of the fight. Online and offline, the talk was about the match. We now know the outcome, with the American boxer keeping his win record clean. On the other hand, the Filipino boxer believed he won, even though the judges say otherwise. Some of his fans felt the same way and even went a step further slinging insults at Mayweather. This got me thinking about being a sore loser. Some people are sore losers by nature, even if they would never admit it and their actions say otherwise. Do you always have some sort of excuse explanation as to why you didn’t win? Do you have the tendency to believe that you won even if others don’t think so? Do you blame other people and/or circumstances for your loss? Do you point out your opponent’s faults to somehow shift the attention to your loss? Do you throw a tantrum or sulk when you lose? These are only a few questions that can determine if you’re a sore loser. If you answered yes to most of these questions, then the chances are you’re a sore loser. There’s this adage that no one likes a sore loser, and if you want to better yourself, the first step is to accept that you’re a sore loser. The next step is to take specific actions to stop being a sore loser. Whether you lost a game or a promotion, always offer your congratulations to the winner. You may not want to, but by doing so, you already take a step in the right direction. Doing the right thing will help you in the long run. Allow yourself to feel bad. No one likes losing. You can’t control the presence of negative emotions when you lose. Feeling bad is natural. What you can control is how you react and control those emotions. Feel bad as much as you want, but do not dwell on it. Better yet, do not act rashly while you’re still feeling bad. Distance yourself from the situation – may it be physically or mentally. Not only does it make you look bad, but it will become a habit, and you’ll fall into the trap of not being responsible for yourself and your actions. Instead of pointing fingers, analyze the situation and what happened. Even if you find that the playing field is not so level, try to go beyond that. Practice makes perfect. Speaking of going beyond the playing the blame game, try to look for the positive. It is not easy, to be sure, but if you look hard enough, there will always be something to find. Even better, identify what went wrong on your end, and come up with a plan that you can execute the next time you encounter a similar situation. Having that plan in your head will help avoid defeat in the future and even if you do lose, you’ll have a different perspective. 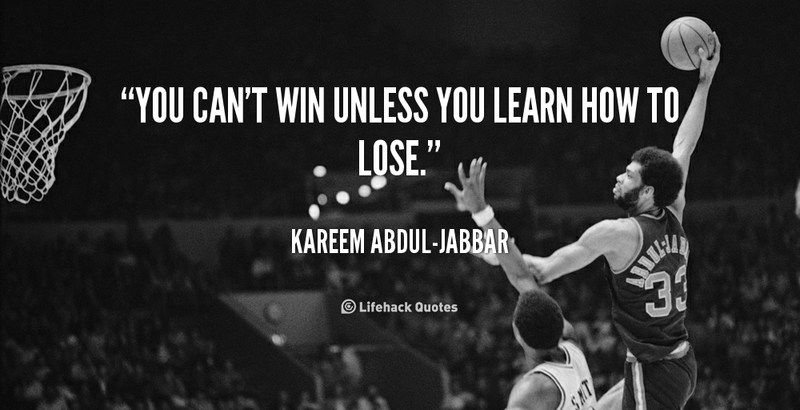 As Kareem Abdul-Jabbar – one of the greatest basketball players of our time – said, “You can’t win unless you learn how to lose.” Part of learning how to lose is to stop being a sore loser. It’s up to you how you deal with it. So what’s it going to be?